Cartagena is a fascinating city to visit at any time of the year, but it is particularly interesting during the Romanos y Carthagineses Fiesta. 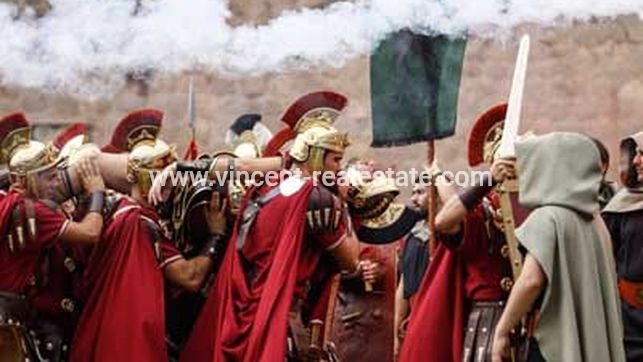 This re-enactment of the battles between the Romans and the Carthaginians is well worth seeing, as it has been declared as being of National Tourist Interest. It takes place annually, this year it will be held between the 21st and 30th September 2018. 21:00 Opening Speeches in the Plaza del Ayuntamiento. 21:45 March towards the Festival Camp. Route: Plaza del Ayuntamiento, Mayor, Puerta de Murcia, del Carmen, Plaza de Espana, Alameda de San Anton, Puente Carthago Nova finishing at the Festival Camp. 23:00 Inauguration of the Festival Camp. 20:00 Founding of Qart-Hadast at the Port. 20:30 Destruction of Sagunto on the stage at the Port. 21:30 The century Assembly on the stage at the Port. 21:00 Wedding of Hannibal and Himilce on the stage at the Port. 23:30 Carthaginian Weddings at the Festival Camp. 22:30 Great Latino Fair and Gastronomic Tasting at the Festival Camp, calle romana. 20:00 Landing of the Cartaginian Navy and the hiring of mercenaries on the stage at the Port. 21:15 Hannibal Marchs to Rome. Route: Plaza del Ayuntamiento, Mayor, Puerta de Murcia, del Carmen, Plaza de Espana, Alameda de San Anton, Puente Carthago Nova finishing at the Festival Camp. 00:00 The Plans of the Gods (women of town ask the Gods to aid their men in the battle) at the Festival Camp. 10:45 Maritime Battle in the Port. 17:00 Landing of the Roman Army at the Port. 18:00 Great Battle to conquer Qart-Hadast at the Cuesta del Batel. 20:30 Great Military Victory Parade after the surrender of the city. Route: Plaza del Ayuntamiento to the Festival Camp. 19:00 Great Parade of the Troops and Legions. Route: Plaza del Ayuntamiento, Mayor, Puerta de Murcia, del Carmen, Plaza de Espana, Alameda de San Anton, Soldado Rosique, Puente Carthago Nova finishing at the Festival Camp.